édité le 15/11/2017 - Plus de news de "Qatar Petroleum" - Voir la fiche entreprise de "Qatar Petroleum"
Qatar Petroleum entered into an agreement to acquire a 30% participating interest in the Contractor’s interest under the exploration and production sharing agreement (“EPSA”) for Block 52 offshore Sultanate of Oman. The parties under the EPSA are the Government of the Sultanate of Oman and the Contractor, which -upon satisfaction of all Omani Governmental approvals- will comprise of Qatar Petroleum with a participating interest of 30%, Eni with a participating interest of 55%, and Oman Oil Company with a participating interest of 15%. The Agreement was signed by Mr. Saad Sherida Al-Kaabi, President and CEO of Qatar Petroleum, in a ceremony held at the Ministry of Oil and Gas in Muscat, Sultanate of Oman, in the presence of H.E. Dr. Mohammed bin Hamad Al Rumhi, Minister of Oil and Gas of the Sultanate of Oman, Mr. Isam Zadjali, CEO of Oman Oil Company and Mr. Claudio Descalzi, CEO of Eni. Commenting on this occasion, Mr. Al-Kaabi said: “I would like to thank the Sultanate of Oman, the Ministry of Oil and Gas of the Sultanate of Oman and Oman Oil Company for their trust and support. We are proud to have this opportunity to participate in the exploration and development of the oil and gas resources in the Sultanate of Oman. This agreement represents a stepping-stone towards further mutually rewarding opportunities, where we hope that our cooperation will bring benefits to all involved especially to the Omani oil and gas sector and the people of Oman”. 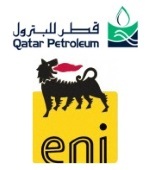 “We are very pleased to enter into this agreement with our valued partner Eni, with whom we enjoy a close business relationship, which we aspire to strengthen further. I would like to thank the executives of Eni, Oman Oil and Qatar Petroleum and their respective teams who contributed to this important milestone,” Mr. Al-Kaabi concluded.